Since the beginning of time, mankind has sought for the magic elixir that bubbles from the fabled Fountain of Youth. Most of us want to look and feel young, and apple cider vinegar may be the answer you’ve been looking for. Historically, infections on the face, around the eyes and in the ears have been treated with a solution of vinegar and water. It works because apple cider vinegar is antiseptic (it kills germs on contact) and antibiotic (it contains bacteria which are unfriendly to infectious microorganisms). In fact, Yale-New Haven Hospital has begun using it to routinely clean scrub room sinks and it’s working better than the commercial product it replaced! So why is apple cider vinegar so good for your skin? One reason is that it has a pH which is nearly the same as healthy skin. So applying ACV helps to normalize the pH of the skin’s surface. Make sure your ACV is raw, organic and unfiltered to get all the real goodness it contains. ACV that’s been heated has had all the enzymes killed, and non-organic apples contain high amounts of pesticides which are then concentrated into the fermented final product. Lead in production processes is another cause for concern when choosing apple cider vinegar, whether it’s in the containers it’s packaged in or the plant it’s processed in. Lead can leach into food in as little as 10 minutes. And if you haven’t disposed of your aluminum pans by now, do so. ACV will leach aluminum from pans, and aluminum has been identified as a contributor to Alzheimer’s disease and dementia. Here are some of the most popular ways to use ACV on your skin for beauty, health and comfort. To ensure soft radiant skin and prevent blemishes, condition your skin while you’re sleeping. Mash 3 large organic strawberries into 1/4 cup apple cider vinegar and let it sit for 2 hours. Strain the vinegar through a cheesecloth and pat the vinegar onto your face and neck. In the morning, rinse it off with warm (not hot) water. If you already have pimples and blackheads, they’ll soon be gone. ACV has been found to be the most effective agent used for completely inhibiting the growth of harmful bacteria. Winter is harsh on the skin. Cold wind and temperatures can cause chapping, and dehydration occurs from inside as well as outside because the body needs more water to undergo metabolic processes. Summer heat can also be dehydrating and the sun can create a lot of damage to the tender skin. To protect your skin from the ravages of the environment, apply a very thin protective coating of virgin olive oil and apple cider vinegar – half and half – before you go outside. You can apply it to the face and neck, arms, legs, feet and even your scalp. Just don’t overdo it or your skin will feel sticky. A dime size amount is enough to cover your upper body. Sometimes called liver spots, age spots can disappear if you wipe them daily with ACV. Apply with a soft cloth or cotton ball and in a few weeks they will have faded significantly. Relieve itchy skin by patting apple cider vinegar on the area, or on an entire section of skin such as the arms, legs or back. It won’t hurt you. If the itch is near the eyes, dilute the vinegar – 4 parts water to 1 part vinegar. For a full body treatment, put 2-3 cups ACV into a tubful of warm water. Don’t let the water get too hot as this can be drying and will aggravate itchy skin. ACV is also safe for rectal itching. If you’re plagued by the itching and peeling of athlete’s foot, soak your socks or hose in a solution of 5 parts water and 1 part ACV for 30 minutes, then was as usual. Heavily soiled hands can be cleaned while giving them a soothing treatment. This is great for gardeners, crafters, painters, artists or anyone else who uses their hands. Simply scrub with cornmeal or oatmeal that’s been moistened with apple cider vinegar. Corns and calluses will fall away overnight if you treat them with a vinegar compress. Simply soak a cotton ball in apple cider vinegar and tape it to the affected area. In a day or two, depending on how large the corn or callus is, it will disappear. Nothing ruins a beautiful pair of legs more than unsightly and painful veins. You can alleviate this awful condition by wrapping your legs with a cloth which has been soaked in ACV. Wring out the cloth, wrap the legs and prop them up for 30 minutes. Do this morning and evening. To speed up the process of healing, follow each treatment with a glass of warm water and 1 teaspoon ACV. Add a teaspoon of honey if you like, and sip the mixture slowly. Treating mild burns with apple cider vinegar is easy. Simply use a sterile gauze pad and pat vinegar onto the affected area. Do not use a cotton ball because fibers may stick to the wound. ACV is particularly effective for neutralizing alkali burns (lye, sulfuric acid, hydrochloric acid, lime, silver nitrate). Please Note: Do not treat serious burns of any kind yourself. 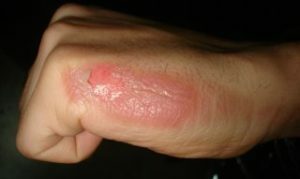 Burns can come from chemicals, scalding or flames. Blistering, pain, breathing difficulties, convulsions, vomiting, unconsciousness, and dizziness are all signs that a burn is serious. Do not try to wash or wrap the wound. Seek emergency medical help immediately. Cool sunburn by bathing in a tub of lukewarm water. Add 1 cup of ACV. The ACV will make the water feel cooler on the skin, will neutralize the sting and will prevent any infection from taking hold. 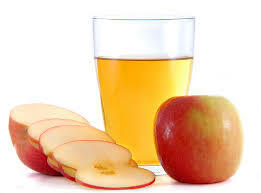 Apple cider vinegar can benefit all skin types whether your skin is dry, oily, aging, combination, or blemished. Families have been handing down apple cider vinegar recipes for generations, and they change over time, but one consistent theme remains throughout- apple cider vinegar will keep you vigorous and make your skin glow. It’s good for you both inside and out!